As the Rabbinic Director of Jews for the Preservation of Firearms Ownership, I was consulted over the controversy you created surrounding the use of a Jewish Star of David in the Illinois based Gun News newsletter. 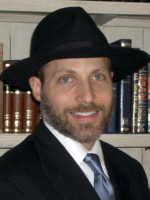 I write to you as a fellow Orthodox Jew. 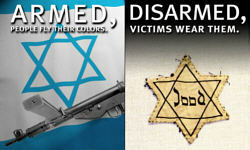 The graphic on the cover of the newsletter contains a jarring juxtaposition: On the left, a blue-on-white Star of David (with a rifle in the foreground) overlaid with the caption: “ARMED, PEOPLE FLY THEIR COLORS”. Senator, I know the history of the Holocaust, but I fail to see what could possibly be wrong with the image. With regard to the left side, the world may not like the image of the self-reliant and proud Israeli Jew flying his colors, but the world must contend with him. The Israeli Jew is armed and will (and does) defend himself. Could it possibly be that you take issue with that? With regard to the right half of the image, it is a fact of Jewish history that during the Holocaust – as during many prior dark periods in Jewish history – we were systematically disarmed as a people, persecuted, attacked, and murdered, often en masse. Are you espousing unarmed victimhood over armed self defense? Could you possibly be making this inference? Frankly, I seriously question your motivations in expressing outrage in this matter. What aspect of this image of the Yellow Star are you offended by? Is it that the history of the Jewish people disturbs you? That would be good, and appropriate. The brutal violence heaped upon us by various bigoted and murderous factions throughout history should disturb you. It should disturb all good and moral people. Is it the image of the Yellow Star itself? It is a disturbing image. I can’t see a Yellow Star anywhere, not even in a museum, without having a visceral emotional response. As you stated in the Sun Times, “Just to see the image is scary.” However, does that mean that we should suppress the image of the Yellow Star and erase our memory of history? Or can only groups that espouse an anti-gun liberal mentality (like the ADL) use the images of the Holocaust? I assume that you have you studied modern Jewish history, and I see that you successfully advanced House Bill 6059 to establish an Illinois Holocaust and Genocide Commission. Are you aware that the Nazis disarmed Jews prior to Kristallnacht? The Nazis efficiently did so using detailed gun owner registration lists similar to the registration lists that you presently have, and personally advocate, in Illinois. The Yellow Star, “gun control”, and gun confiscation are inextricably connected in the history of Nazi Germany…and therefore inextricably connected to the Holocaust. Additionally, those same Nazi gun laws that disarmed all German Jews prior to the Holocaust, unconscionably became the foundation of the U.S. Gun Control Act of 1968. Are you aware that Senator Thomas Dodd, the author of the Gun Control Act of 1968, asked the Library of Congress to translate the Nazi Gun Control Laws into English for him? He then incorporated language from these Nazi laws into the draconian federal usurpation of our rights that he authored. Read about "Gateway to Tyranny" and The Gun Control Act of 1968. As Jews, we are commanded to know and remember our history. As a Jew, I hope that you find these facts of the history of America’s foundational “gun control” scheme deeply troubling. Additionally, you are no doubt aware that the Jewish people have been at the wrong end of the gun barrel for far too long. America is one of the few countries in the world where Jews are entitled to embrace firearms as the most practical means of our own self-defense. Is your discomfort truly at the image of the Yellow Star? Or is your feigned offense at the image a veil for your contempt for the suggestion that US citizens, both Jew and non-Jew, have a right to defend themselves with firearms, and that this is a G-d-given right affirmed by our Second Amendment in the U.S. Constitution? As an elected official, you no doubt swore an oath to uphold and defend that Constitution – not just the parts you like. Senator, what do the words, “Never Again” actually mean to you? To me those words mean that we must learn the lessons of our Jewish history … and then assertively and realistically prevent repetitions thereof. That means Jews with guns, guns that appear on no government registry. And this emphatically applies to every other law-abiding, moral, and decent American as well. In a related news item, your like-minded victimhood co-religionists in the Anti-Defamation League say that relating “gun control” schemes to the Holocaust “trivializes” the Holocaust. This assertion is perversely distorted in that quite the opposite is true: disarming Jews and the righteous non-Jews who would come to their defense trivializes the lessons of the Holocaust. Similarly, voluntarily disarming ourselves and putting blind trust in the fickle good intentions of government protection trivializes the horrific losses of the Holocaust -- and all the other government-sanctioned genocides of the last one hundred years. See the JPFO genocide chart, on the page about "Death by Gun Control"
Using the memory of the Holocaust as an anti-gun, anti-self defense propaganda smear desecrates the phrase “Never Again” and insults the memory of the brave Jews and Righteous Gentiles who did fight back against murderous tyranny. Senator, your misguided “gun control” philosophies are a danger to both American Jews and American freedom. Your advocacy and support of “gun control” legislation mimics the evil behavior of the enemies of the Jewish people and enemies of freedom: the Ottoman Turks, Vladimir Lenin, Joseph Stalin, Adolph Hitler, Mao Tse Tung, and every other blood stained dictator of the last one hundred years. I sincerely hope you will reconsider the morality of your positions on these matters. To that end, I have enclosed two complimentary gifts: “The Ten Commandments of Self-Defense” and “No Guns for Jews.” “The Ten Commandments” goes through sources in Jewish Law that not only endorse but require a Jew to defend himself and the innocent. “No Guns for Jews” is a documentary that chronicles the historic use of “gun control” as a means of oppressing the Jewish People. Note - there is now an associated handbill on this subject.